Tomorrow, the second Saturday of the month, dozens of people will gather at Friendship Baptist Church for fellowship and a free meal provided by the church. Since 2014, the church at 5200 W. Jackson Blvd. has been hosting a monthly free community meal. The goal: to bring people of the Austin community together in a safe haven and allow them to socialize with their neighbors. “Our 2nd Saturday community meal is something I find extremely important,” said the church’s pastor, Reginald E. Bachus. When Bachus became pastor in 2006, he said he wanted to build a ministry focused on fellowship and community. Sharon Hartshorn, president of community outreach for the church and an active volunteer in Austin, said it was “the grace of god” that brought the opportunity to her church. The other churches involved in the monthly meals are: Truth and Deliverance (3 S. Laramie, the 1st Saturday), Bethel Lutheran Church (130 N. Keeler, the 3rd Saturday) and Garfield Park Community Worship Center (4100 W. Jackson, the 4th Saturday). Meals are served from 1 to 4 p.m. The food ministry has a partnership with Trader Joe’s, which delivers food to the four sites a week before the community meal takes place. One recent Sunday, the church received 30 pounds of chicken that was used to make fried chicken and chicken noodle soup. The food is prepared and cooked by the churches’ various ministries and volunteers or organizations looking to serve their community. “In our church, we have eight ministries, and we ask a different ministry to host each month,” Hartshorn said. 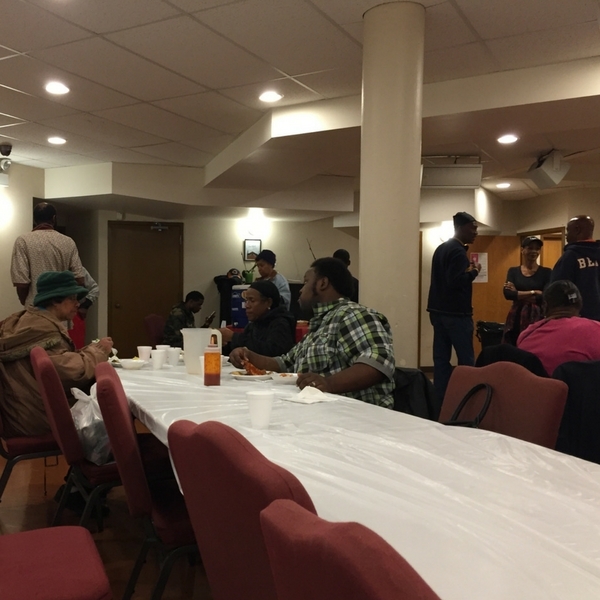 One recent Saturday, it was the church’s Missionary Society hosting the community meal alongside volunteers from 100 Black Men. John Griffin, 60, an Austin resident, looks forward to the second Saturday each month. Griffin said he loves to see people taking the initiative to bring positivity into urban communities plagued by violence and drugs. “If the people in the community can come together and find a way to communicate, they can create change,” he said. The meal brings out an array of people from across Austin and its surrounding communities. Joshua Dinkins, 22, makes it a goal to attend the community meal every month. The Austin resident said he sees this as a way for him to be safe and fellowship with people just like him and he hopes to start volunteering one day. Betty Gilliam, a church member the last 10 years, has attended every community meal since 2014. Gilliam loves to see everyone come together to put on the community meal. Her two granddaughters, both praise dancers, often participate and help serve, too. As few as 75 and as many as 140 people have been served at one sitting. Hartshorn hopes to attract even more. “I often hear people say, ‘Oh, I’m not coming because this is for the poor and or the homeless,’” she said. Should pastors get involved in politics?